Is there a more beautiful sound in the world than the sizzle of frying jalebis early in the morning? South Indians, or should I say Tamilians, can be cantankerous purists. No mixing tastes. No adding sugar to dal like the Gujaratis do; or adding jaggery to rasam like the Kannadigas do. Only one vegetable per sambhar; be it okra, brinjal or small onions. If you mix multiple vegetables, you are a caterer who is trying to palm off all the cheap vegetables available into one pot. These Tamilians ought to taste the pleasures of breakfast in Varanasi. It might change their minds. I am standing at Vishwanath Mishthan Bhandar in Vishweshwar Ganj. It is 8am and I have just done yoga and pranayamwith a hundred strangers on the banks of the Ganga, led by a female teacher who shouted, scolded and coaxed us into stretches, bends and submission. Just show up at Assi ghat at 6am if you would like to join in. Suitably lubricated, my body is ready for its next round of lubrication. At the Vishwanath Bhandar, four men sit outside, frying stuff. Have you heard the sizzle of a jalebi early in the morning? It is the most beautiful sound in the world. Chopin’s Nocturnes have nothing on the twin sounds of jalebi and kachorisizzling in oil right next to each other. I stand with the milling crowd. It is my turn. I hold out Rs.10 and get two leaf bowls. An impassive man ladles aloo sabzi into one leaf bowl; and the kachori in another. Now comes the dilemma. How to stand, balance these two bowls in one hand and eat with the other? The others around me are doing just fine; they’ve had years of practice, darn them. 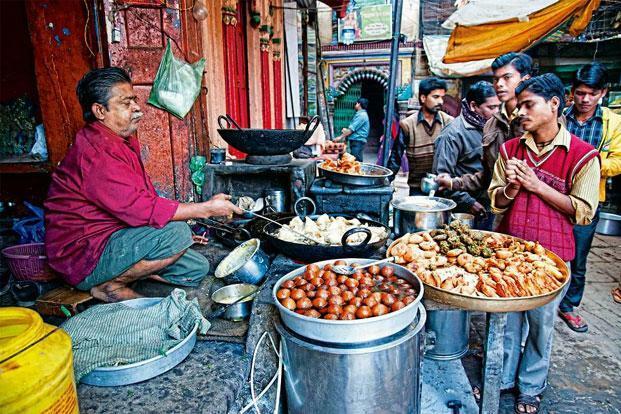 If I could be born again, I would come back as a Kashi vasi (Kashi resident), not necessarily for the good karma but for the terrific kachoris. I have had kachoris in Jaipur, Haridwar, Delhi and Bengaluru. So far, the ones in Kashi are the best. They are fluffy, not brittle. They hold their round shape and have a respectable amount of dal. They collapse like a bubble when you tear them open. The best part is the aloo sabzi: a trite tangy, just enough spicy, and piping hot. The only way to make a kachori better is to mix it with jalebi. It is like adding a pinch of salt to hot chocolate. The shot of pure sugar makes the shot of pure cholesterol better. Best if you don’t think in those terms and use the term that teenagers these days use to explain everything: YOLO (You Only Live Once). Ergo, eat kachori-jalebi for breakfast; if possible, every day. Once breakfast is done, I go temple hopping. At the Sankat Mochan Hanuman temple, hot laal pedas (red pedas) are brought out. Devotees buy boxes of them to take to the Hindu god Hanuman and then distribute to those gathered. I stand in line, awaiting my share. A lady in a purple sari hands me one; then, seeing my face, she gives me another with a smile. “Jai Hanuman,” I say and pop one into my mouth. She looks pleased. I stop half-bite. Is this why India is overpopulated? Too late. The peda is “too good”, as my nephew, Harsha, says. The trick to a good peda, and I speak as someone who has never made a peda in her life, is the consistency. It has to melt in the mouth but you should be able to chew the last bits. You should make those popping sounds that babies make when they relish food. In Tamil, we call this naaka chappi kotti, which is like saying, “making clicking and clapping sounds with your tongue”. A good peda should make your tongue clap. At the Annapurna temple across town, someone is serving sesame rice, perhaps because it is Saturday. Karnataka, where I live, is home to several “rice varieties”, or “chithra-anna”, as we call it: coconut rice, lemon rice, tamarind rice, curd rice, and, best of all, bise bele bhaath, which literally means hot lentil-rice mixture. Sesame rice is not often made or served. It is a delicacy and an acquired taste. I acquired it in Kashi. The recipe is simple: roasted and ground black sesame seeds, red chillies, curry leaves, some urad dal, and a good helping of asafoetida. Grind it all up and mix with hot rice. Here too, the leaf bowls make their appearance. If you like the depth and girth of good sesame oil, you will love sesame rice. It is great for vegans because it contains a ton of calcium. At the Kashi Vishalakshi Temple, this wide-eyed goddess is served some ghee-dripping sheera as prasadam. The sponsor of this prasadam ladles out a spoon to a line of devotees, including me. All this eating has made me thirsty. The great thing is that you can get thandai with bhang in Varanasi on an average day. You don’t have to wait for Holi to indulge. Lord Shiva, the ascetic, loved his bhang, made from the leaves of the cannabis plant. At a government bhang shop, I nervously watch the vendor pour a respectable amount of this green concoction, before adding chilled milk laced with crushed nuts, sugar and saffron. The resulting drink is slightly bitter. It is supposed to be hallucinatory. It makes people giggle and wake up with what seems like a hangover. The other dish that is a signature of the city is not as potent. Banarasi paan is a digestive. I grow betel leaves in my garden. How different can this be, I think, as I stand in front of a tiny shop and ask for a paan. “With zarda or without?” asks the vendor. Zarda comes from tobacco. It is addictive; gives a high. How bad can it be? With lightning fingers, the vendor smooths open a bright green betel leaf. He throws in several items: betel nuts, lime paste, fennel seeds, a pinch of zarda, rose petal jam or gulkand, and what looks like tutti-frutti. He folds it into a triangle, sticks a clove to hold it together, and hands it over to me. I have eaten paan before, but this one has oomph. As I chew, I can feel myself becoming light-headed. The juices flow down my throat, inducing a pleasant sensation of relaxation. I smile beatifically and thank the vendor. I wave my hand and keep walking. It is a beautiful day. I don’t remember very much of what happened after that; except that I, much like a Hindi film heroine, woke up in bed. Hello Shoba, Happy New Year (belated) and a shout out (as my daughter says) to all the regulars and not so regulars! Very nice article and what a nice way to kick start the year!! I can’t resist but point out to Vinay / RG / Kaushik — Banaras jalebi & bhang are quite a departure from saris and filter coffee so at least this year make a resolution to be nice to our Shobarista! In my executive capacity as Chief Ombuds Officer (COO) I am adding bhang to the specials board of the coffee house – but it will only be served to those who play nice…..
Lucky you woke up in bed 🙂 Aren’t you supposed to spit the juice out? Our Mozambican guest came into the house tottering after trying one of those! lLike your kachoris, I thought the pani puri at Kasi chat Bhandar was the best I have ever had anywhere. Thanks Usha. Indeed. I was supposed to spit it out. Oops! Ubiquitous Jalebi is different in every part of the country. South Mumbai has its own spots for excellent Jalebis. In Mumbai as in Gujarat, Jalebi goes with “Fafda Ganthias” papaya-chillies and besan concoction. Visit “Swati Snacks” (Tardeo Road), Jain Sweets (Napean Sea Road)- both on Sundays or Holidays from 7am till 11 am or so. The one near “Panchratna” building, the old Diamond Bourse at Opera House is supposed to be the ultimate and available every day- thanks to the diamond merchants. MUmbaikars will not accept Jalebis unless loaded with genuine saffron! Artificial flavouring will noir just do! I have yet to meet an Indian who does not like Jalebis ! Wow, Kishore. We must go Jilebi-hopping one day. Fafda Ganthias sound great!! I loved the Peda part a lot.. the humor laden in the peda was just too good.. Very well written.. Hope to see a similar “prasad” experience in Bangalore from you..